Baden is a neighborhood in North St Louis from which 90 houses were removed to make way for three flood mitigation detention basins. 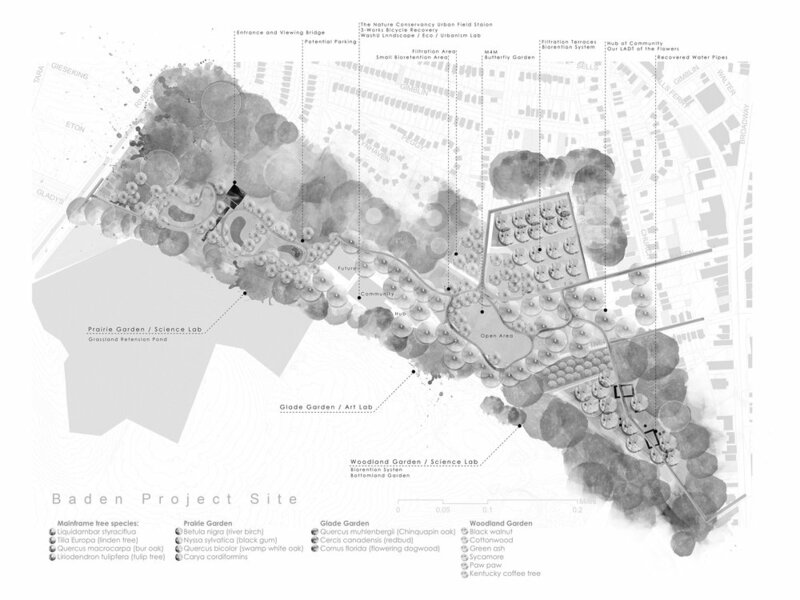 The strategy was to integrate green infrastructure with the Metropolitan St Louis Water District plan for the basins, and provide the community with a performative terrain that reflected the city’s biogeographic origins. Each of the three basins became gardens - prairie garden, a savannah or glade garden, and a bottomland woodland garden. The objective is to evolve a landscape that resonates with the community’s aspirations and St Louis regional ecosystems, at the same time as achieving MSD’s water management objectives. The basins are redefined as gardens to diminish the effect of the instrumentalisation of the neighborhood landscape that the word “basin” implies, to enhance legibility of the overall social-ecological thematic, to emphasize the constructed nature of the project, to domesticate the native plants that are used exclusively throughout the proposal, and to contribute to the revaluation of the neighborhood as a great place to live.